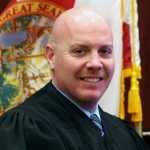 TALLAHASSEE- The Florida Supreme Court has taken under advisement the Judicial Qualifications Commission’s (JQC) recommendation that 7th Circuit Judge Scott C. DuPont be removed from office. On April 30, 2018, Judge DuPont filed his last response to the Court’s Order directing him to show cause why it should not impose the JQC’s recommended sanction of removal. After hearing from Judge DuPont and the Commission the Court has accepted the case for consideration without oral arguments. There is no timeframe for a final decision by the Court. Photo credit: 7th Judicial Circuit.